Plum Tree Studio is a private urban retreat with ultrafast wifi and great shower pressure! Set in a cottage garden with glorious plum tree. Our friendly house cats who love a pat but aren't allowed in the studio. We live nearby so if there's anything you need, we are just a phone call away. Lake Taupo is a beautiful place with lots of activities to do and sights to see. Try the amazing day walk Tongariro Crossing over the volcanoes, Huka Falls, fly fishing, Riverside Markets, bush walking, visit Lavaglass gallery and our many cafes. Hi Im Fiona, an Aussie living in NZ with her husband, two little boys and three cats. We love garden, hiking, good food, healthy living and Yoga. We also enjoy hosting and meeting guests! Plum Tree Studio is a special place to rest and stay, set in a garden. We love giving guests the space to enjoy the delights of Taupo. Comfy hammock and furnished with original pieces and artwork. Off-street parking is available immediately next to the porch. Standard bathroom towels, bath mats, hand towels, face washers, tea towels, beach towels. Olive oil, salt, pepper, salad dressing, coffee, tea, herbal tea, hot chocolate mix, paper toweling. Plates, bowls, cups, glasses, wine glasses and cutlery, salad bowl, two chopping boards, colander, masher, bottle opener, grater, serving spoon, salad servers. Magazines, reading books non-fiction and fiction. A sweet little studio, tucked away on a quiet private property. We loved coming back here away from all the action in Taupo! Would have done 5* because it was great except my old back had trouble with the mattress. That said, the twin mattress in the room was excellent. Thanks so much! It was a pleasure hosting, we would be happy to have you stay again. Close to town, cosy and our favourite place we stayed throughout our entire trip through NZ. Very nice and charming studio under the plum tree. Very nice and charming studio under the plum tree. Great location and has everything you need. Highly recommended! Perfect for our needs. We were just staying one night, to break up our long drive. 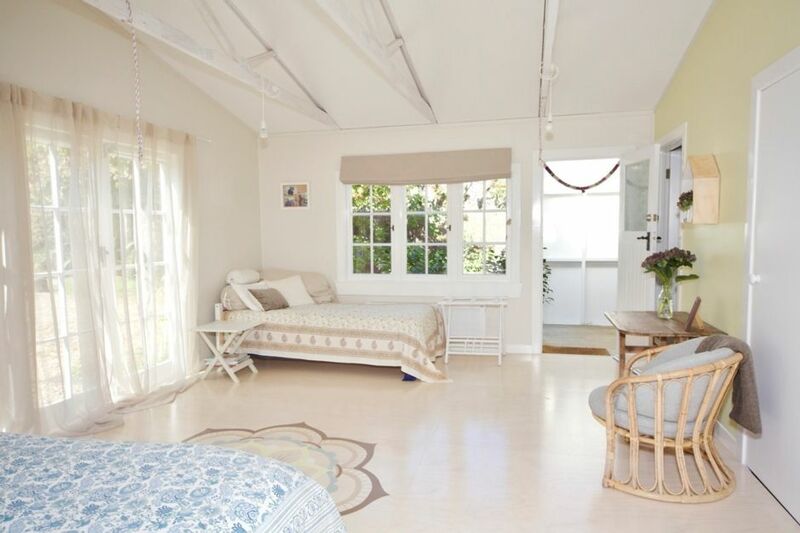 The studio is lovely, a gorgeous space, very light and airy, the grounds have a lovely cottage garden feel to it. If you need a dark room for sleep, I wouldn't recommend it in summer. In saying that, we fell asleep with no problems, comfy beds and super quiet area.